The Vermont Wood Manufacturers Association (VWMA) has named David Hurwitz the Woodworker of the Year. And no wonder: The Randolph artisan turns straight wood into amazingly sensuous pieces, from utensils to dining room tables. You'd think there might be alchemy involved and not just woodworking tools. Hurwitz’s work commands attention. His custom, glass-topped Lake Champlain cocktail table, for instance, displays an innovative curvature — in sustainably harvested maple — that mocks the driftwood found on lake shores. It seems almost too pretty to be practical. His benches for Montshire Museum of Science in Norwich, installed along the outdoor garden path, are crafted from locally grown white oak, and are as aesthetically pleasing as they are sturdy. The taffy-like carved wood framing a mirror or forming a coatrack is impossibly sinewy. Hurwitz’s vision for his craft represents a stunning marriage of form and function. 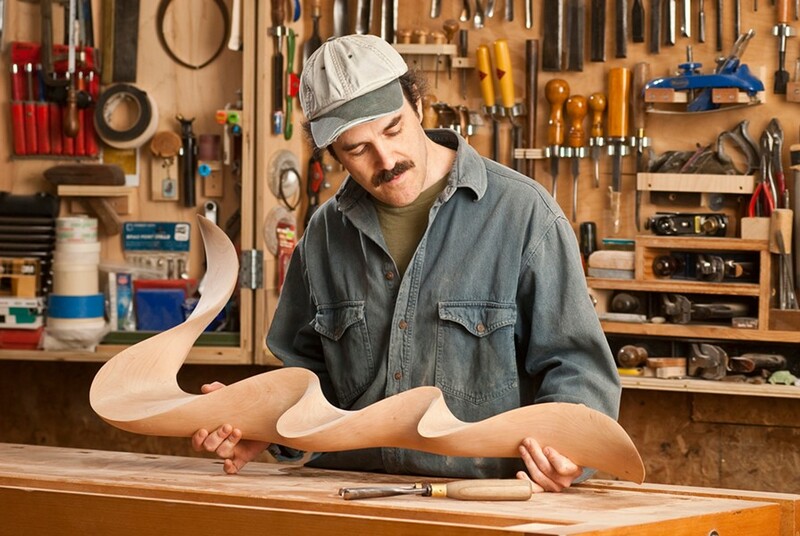 Hurwitz earned a BFA in woodworking and furniture design from the School for American Craftsmen at Rochester Institute of Technology, and has been a professional woodworker since 1998. He's won numerous awards for his furniture and woodenware, and been featured in many industry publications. Hurwitz has served on the VWMA board of directors, is a member of the Guild of Vermont Furniture Makers and teaches the next generation of crafters at the Vermont Woodworking School His work can be seen at the annual Vermont Fine Furniture, Woodworking & Forest Festival in Woodstock, Vt., other craft shows and at his studio, David Hurwitz Originals, in Randolph.